The music on this disc by The Sixteen, the United Kingdom-based choir and period instrument orchestra founded by Harry Christophers, includes work from various recordings that date back to 1991. Guided by Christophers, The Sixteen displays a technical command of polyphony and counterpoint matched only by the eloquence of their singers, memorably arrayed in this sacred and secular music from William Cornysh and Benjamin Britten. Sacred and Profane is a sublime exaltation of the human voice in formal and more adventurous settings. The work of Cornysh (father and son) and Britten takes flight in these voices. Christophers and The Sixteen bring new renown to the Cornysh music marked by their more old-fashioned florid melodic style and Christophers and The Sixteen bring new renown to the Cornysh music, marked by their more old-fashioned melodic style and proto-madrigalian manner, as revealed in lucid and dynamic performances of Salve Regina and the celebrated Ave Regina, Mater Dei. Britten’s choral music – the dark elements are rarely far from the surface, especially in the Sacred and Profane sequence – is superbly cast and performed. The Hymn to St Cecilia is quintessential Britten, with text by W.H. Auden and a setting that emphasizes not just the emotional and aesthetic power of music, but its eroticism as well. Britten’s music, like Auden’s poem, combines a classical tightness of form with a complexity of ideas about the role of the artist in the face of a disintegrating civilization. The Sixteen’s voices are clear and pure, and this acoustic gives the music the right amount of bloom. There have in recent years been many CDs consisting of solos or duets taken from the operas and oratorios of Handel. Such recordings always carry the danger of becoming merely a heterogeneous collection of extracts. A number of CDs have rectified this by concentrating on those roles created by particular performers. The CD reviewed here carries that strategy further by giving us a portrait of the soprano Giulia Frasi, who created several roles in Handel’s late oratorios but also sang in works by Vincenzo Ciampi, Thomas Arne, John Christopher Smith and Philip Hayes (extracts from works by these composers are included here). Many of these works were composed after Handel’s death in 1759 and, as David Vickers points out in an informative accompanying essay, they show how music moved from the high Baroque to the style of J.C. Bach and Haydn. We don’t know much about what kind of singer Frasi was. My sense is that she had a bigger voice than Ruby Hughes, who is a lovely lyrical soprano. Most of the arias are slow and are designed to evoke pathos. This no doubt reflects the kind of parts that Frasi was asked to sing. The only aria which allows the singer to show her virtuosity is from Arne’s Alfred. It was written for Frasi as part of the 1753 revival of the work and is given the marking allegrissimo. The singing and orchestral playing are both very fine on this disc. The members of the orchestra are not listed; if they had been, I would have singled out the splendid first oboist. By the year 1818, the 26-year-old Rossini was well on his way to becoming the most successful composer of opera in the Appenine Peninsula (i.e. today’s Italy). He left Venice in 1815 with a dozen operas written, including two masterpieces, and – via Milan, Rome and a few more masterpieces – he arrived in Naples with a lucrative contract from Teatro San Carlo, Naples’ resplendent opera house that rivalled Milan’s La Scala. He was a busy man, working furiously and fast, composing three operas per year plus looking after productions of his earlier works in Rome, Milan and Venice. He was already a rich man and he also married his leading lady Isabella Colbran, a smart move in more ways than one. Of Rossini’s 39 operas, Ricciardo e Zoraide is the 25th now being recorded by Naxos. A heroic opera based on legends attached to Ariosto’s epic poems about Orlando and the Paladin knights of Charlemagne, it is quite long. The plot is unwieldy and unremarkable, but the music is forward-looking, “with dark-light contrasts, sophisticated melodic invention and the deployment of physical stage,” like the use of off-stage orchestras for spatial effects for the first time. This top-quality recording has some spectacular voices, mainly tenors (of whom Rossini had an abundant supply), with the two rival lovers Maxim Mironov (Ricciardo) and Randall Bills (Agorante) outdoing each other in vocal acrobatics. Of the ladies, Alessandra Marianelli has the Colbran role as Zoriade, the damsel in distress, and Silvia Beltrami (mezzo-soprano) is the jealous queen; both gorgeous voices. When the four appear together expressing their conflicting emotions, Rossini exercises his heavenly powers in ensemble writing – later inherited and made immortal by (at the time) a certain five-year-old boy, Giuseppe Verdi. Canada is a frustratingly large place. Despite having sung professionally since the early 2000s, Marie-Josée Lord did not conquer the country until 2012, when her first recording (from 2010) was nominated for the JUNO award in the best classical vocal album category. Personal disclosure here: I was one of the judges, voting, albeit unsuccessfully, for that album. To say that Lord’s voice stunned me would be an understatement. She has proved to be an elusive singer – appearing mostly in Quebec, and not gracing operatic stages frequently enough. In addition, Lord holds a deep conviction that she must be a popular singer – in her concerts and on record – mixing Quebec chanson, spirituals and classical pieces. That is why her new album is such a rare gift: a full CD of operatic performance. And what a performance it is! As her voice matures, she relies more on vibrato. What may have been lost in agility is more than compensated for in power and range. She can easily become one of Verdi’s heroines – I would give my proverbial eye tooth to see her on stage as Violetta! The music of Massenet and Puccini, especially as gracefully presented here by Maestro Trudel, suits her well too. Her self-titled debut CD became a bestseller – over 30,000 copies sold, which in the world of classical music is massive. This one has a potential of beating that record – and bringing an extraordinary performer to full triumph over the Great White North. In the final years of his life Alfred Schnittke became increasingly interested in religious music and in the relationship between his music and the Russian orthodox tradition, both religious and musical. The Psalms of Repentance, which date from 1988, consist of 11 penitential psalms followed by a final wordless humming movement. Some movements are intensely dramatic; others are more lyrical. It is to the latter kind that I found myself especially drawn. The Russian poems which Schnittke set are anonymous; they date from the 16th century. The central narrative event to which the work alludes is the murder of the youngest sons of Grand Prince Vladimir by their brother in 1015, but many of the psalms are penitential in a more general way. The Schnittke work is complemented by two shorter works by Arvo Pärt, both in Latin: the Magnificat (1989) and the Nunc Dimittis (2003). Both are very moving. 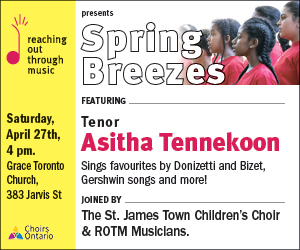 The very fine Estonian Philharmonic Chamber Choir has performed in Toronto several times and many readers will have heard the choir in concert. The choir was founded in 1981 by its first conductor Tönu Kaljuste and has, since 2014, been led by Latvian conductor Kaspars Putnins. Kantorei, a greatly admired ensemble with international tours, workshops and major commissions to its credit, is an elite choir based in Denver, Colorado and led by artistic director Joel Rinsema. This recording of compositions from the past eight years by Norwegian composer Kim André Arnesen (b.1980) places it in the front ranks. Rich, clear tone, balance and expressiveness characterize recordings of these religious and meditative pieces, four of which are commissions by Kantorei and Rinsema. Some Arnesen works show the influence of composers like Morten Lauridsen and Eric Whitacre, with long-sustained tones, division of the chorus’ sections and high clusters of soprano voices that produce radiant effects. Of these, I found the adventurous title work Infinity and the Holocaust-inspired Even When He is Silent especially moving. The lullabies Dormi Jesu and Cradle Hymn (the latter of which was sung for President Obama in the White House) are among the more appealing simpler works. Here babies and parents could perhaps provide the most authoritative reviews! When simplicity ventures into harmonic cliché, though, my inner music theory cop is triggered, as in The Gift I’ll Leave You. In its mastery of textures and vocal registers, Arnesen’s compositional craft is remarkable. The choice of works and the disc’s overall smooth sound also suggest its potential for meditation; in any case I found myself taking long, even breaths. This serene and attractive disc is recommended for both secular and religious listeners. The Trinity Choir was founded in 2015 by countertenor and conductor Daniel Taylor. It is a chamber choir (with, on this recording, 32 singers); they sing a cappella. The centre of their repertoire is the 16th century (Thomas Tallis, John Sheppard, Orlando di Lasso, William Byrd, Nicolas Gombert) but they make a point of also including more modern works. This recording includes the Miserere of the 17th-century composer Gregorio Allegri (much the most familiar work on this disc) and Arvo Pärt’s Magnificat and Nunc Dimittis (which coincidentally appear on the Estonian Philharmonic Chamber Choir’s 2017 Schnittke/Pärt release, also recently reviewed by me for The WholeNote). Most of the singers are young and at the beginning of their career, although several, like the soprano Ellen McAteer and bass-baritone Joel Allison, are beginning to make a name for themselves through their participation in other choirs. The singing is very fine throughout. I was particularly taken with Gombert’s Media Vita with its long melodic lines. As internationally celebrated Canadian soprano and conductor Barbara Hannigan said in a 2015 CBC radio interview: “I love taking risks as a performer …” Her risk-taking paid unexpected dividends when her Crazy Girl Crazy CD was awarded the 2018 GRAMMY for Best Classical Solo Vocal Album. In fact, Hannigan went well beyond the solo vocalist category. She not only sang but also conducted the Amsterdam-based LUDWIG Orchestra. She even had a hand in the newly minted orchestral arrangement of songs from Gershwin’s 1930 musical Girl Crazy in collaboration with Bill Elliott. Sequenza III (1965) for female voice serves as the album’s spectacular curtain-raiser. Originally composed for the legendary American diva Cathy Berberian by Luciano Berio, Hannigan puts her own vocal and intellectual stamp on this vocal tour de force. Berio opened the door to multiple renderings of his score, noting, “In Sequenza III I tried to assimilate many aspects of everyday vocal life, including trivial ones, without losing intermediate levels or indeed normal singing … Sequenza III can also be considered as a dramatic essay whose story [… explores] the relationship between the soloist and her own voice.” I think the composer would be chuffed with Hannigan’s powerfully idiosyncratic interpretation and advocacy of this seminal work. The core of Crazy Girl Crazy is however centred on Hannigan’s long-term love affair with Alban Berg’s opera Lulu, the lead character of which she has portrayed onstage to great acclaim. It is represented here by Berg’s masterful symphonic-scale Lulu Suite, given an emotionally powerful performance by LUDWIG Orchestra under Hannigan’s direction. The album closes with Girl Crazy Suite, the Elliott/Hannigan re-orchestration of Gershwin’s original songs, but re-contextualized in light of Berg’s orchestral sound world. As a long-term fan of the music on this disc, I found it a very satisfying listen. It’s also satisfying to know that in Hannigan this repertoire has a convincing advocate able to convey it with passion and intellectual rigour to future generations.